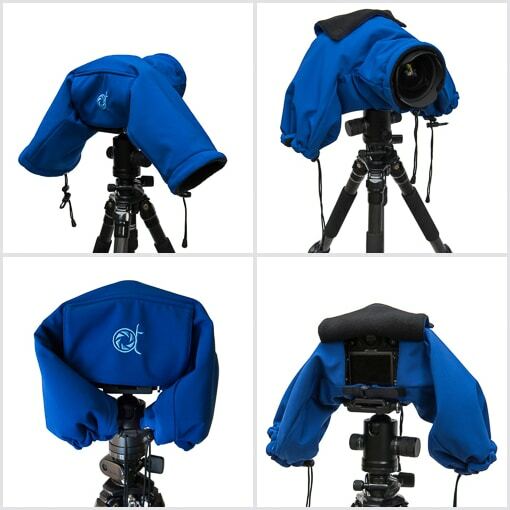 Camera Parkas are designed for outdoor photographers looking at protecting DSLRs and lenses from wind, humidity, frost or cold, and saving battery life. 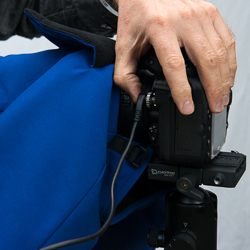 Specifically designed for use with a tripod, the camera parka is ideal for landscape photography such as long exposures, timelapses, night and astro photography. 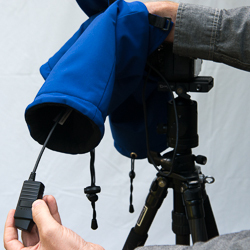 Whether the dew point is an issue, or in foggy or cold weather, the Camera Parka protects camera equipment and saves battery life. 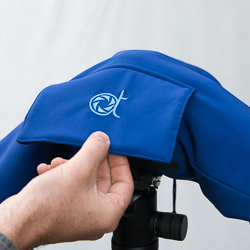 Both covers are made of high quality outdoor fabrics from Polartec®. 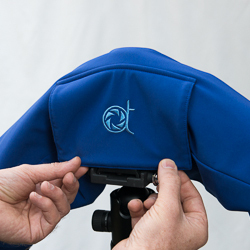 The outer shell is water repellent, durable and blocks wind at 99%. 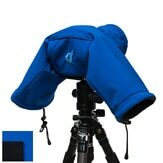 It provides complete protection from wind, moisture and frost. 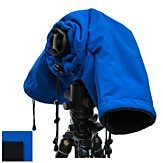 The inner layer is a double fleece providing insulation from cold to the camera and warmth to the hands of the photographer when changing settings. 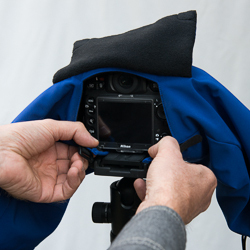 The Camera Parka Pro has an extra layer of thermal fabric around the camera body. 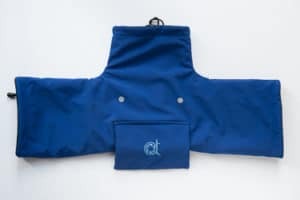 It helps keep the cold out and the heat in, when using chemical heat warmers for instance. Both covers have a version for short lenses or fish eye lenses. Extra pull strings inside the covers are used to secure the front sleeve around short lenses. 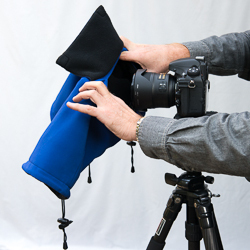 Which Camera Parka is best for you? Use the comparison table below summarizing specifications of the 4 versions available. 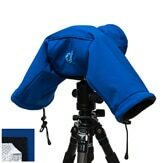 It provides insulation against cold, wind and moisture. It helps keep the cable flexible in cold temperatures, preventing the plastic to harden and crack. 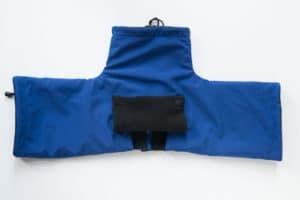 They provide insulation against cold, wind and moisture, extending battery life. 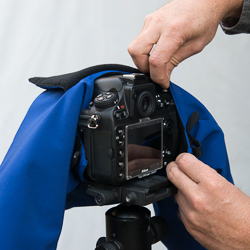 During times when frost can form on equipment, the Camera Parka can help protect against frost forming on the camera body and lens. 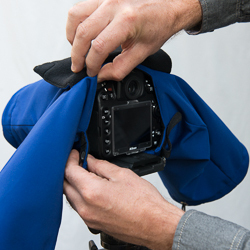 The Camera Parka Classic has a two-layer design, and the Camera Parka Pro has a three-layer design. Fabrics were carefully selected for optimal protection. 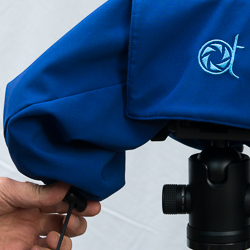 Both the Classic and Pro covers use Polartec® material for the outer shell and inner layer. Earth magnets secure the flap protecting the LCD while closed or open using contact points. 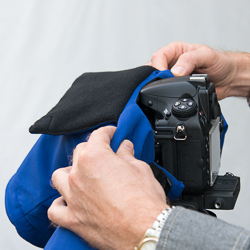 Pull strings are on all sleeves for tightening the front sleeve around the lens and closing the sides sleeves to keep warmth in. 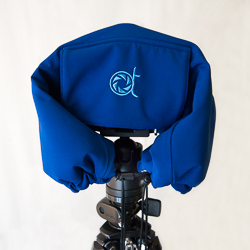 A Velcro strap is used to secure the cover on the camera and adjust it around the tripod plate or head. Manufactured in British Columbia, Canada with high quality fabric from North America. 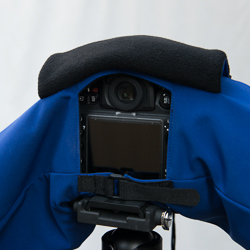 The Camera Parka has been tested over the past 3 years. Prototypes went through modifications and redesign, and different materials were evaluated. We were looking at protection against frost, protection against cold for electronic parts (such as the LCD screen), and mechanical parts (such as the shutter). Wind is a major factor in sub-zero temperatures and protection from wind was also a priority. Tests were performed one last time on the latest prototype before starting production. Results showed improved battery life, protection from wind, complete protection against frost and moisture, as well as protection from extreme cold affecting the shutter. For all tests, we used Nikon D800 cameras and newly purchased batteries from the same batch. The test below was performed in March 2015, at night, at temperatures ranging from -15°C (5°F) to -25°C (-13°F). 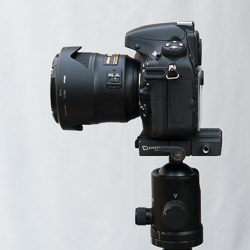 Two Nikon D800 cameras with fully charged batteries were set up on tripods. All cameras were set to F2.8, 3 second exposure, 24mm. Using the interval timer, a picture was taken every 10 seconds. The battery charge on each camera was measured every 10 minutes. 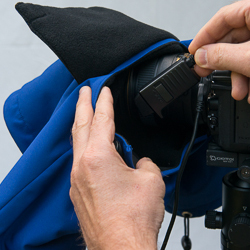 One camera had no protection, one camera was fitted with a Camera Parka. Frost developed within the first half hour on the camera without a cover. 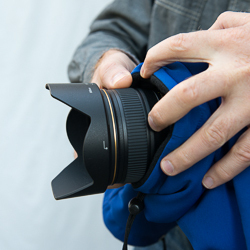 No frost was observed on the camera fitted with the Camera Parka. 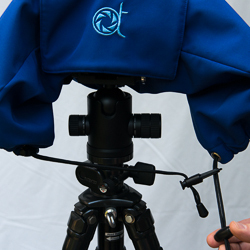 Of note, the protected camera was also used after the 3 hour test for another 3 hours, without any frost developing. The graph below shows the Battery Charge Test results. Results are expressed in percentage of battery charge left for readings taken every 10 minutes. There was an initial effect on battery charge when taking the cameras out and setting up for the test, so the first battery charge readings at 0 min are not 100%. 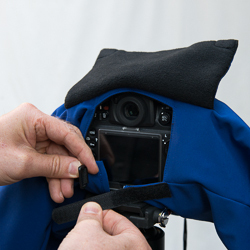 The camera fitted with the Camera Parka was taken out and set up first, then the camera without protection to minimize effects from cold before starting the test. 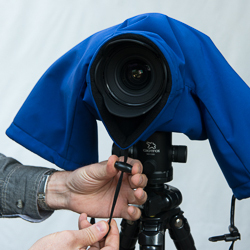 With the Camera Parka, there was a linear decrease of battery charge of 5% observed every 10 minutes, independently of external factors, until the battery charge reached 40%. Then the linear decrease changed to 6% every 10 minutes. With protection from the Camera Parka, the battery lasted for a total of 3h10. Without protection, the battery lasted for 2h20. The decrease in battery life was not linear and quickly dropped when the charge reached 50%. The variations can be attributed to external factors such as a very light wind and colder temperatures. When a light wind picked up an hour into the test, the temperature dropped from -15°C (5°F) to -21°C (-6°F). At 2 hours, the temperature was -25°C (-13°F). This test was performed on a very cold night while shooting Northern lights standing in the middle of a frozen lake. 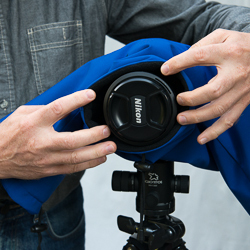 Two Nikon D800 cameras were used, one with and one without a Camera Parka. Temperature was -38°C (-36.4°F) with wind chill; -28°C (-18.4°F) without wind chill. Frost developed rapidly on the camera. The fully charged battery died after 1h15. We could hear the shutter becoming noisier and slowing down. We replaced the battery and took 2 more pictures before stopping the test to avoid damaging the camera. The camera was covered and packed for the night. No frost developed on the camera. Checking the battery charge after 1h15 for comparison with the camera without a cover, the battery was still 30 % charged. There was no issue with the shutter. The battery was replaced after 1h50, and an hour later the photographers packed up because they were too cold. There was no sign of the shutter slowing down and no frost after a total of 3 hours. 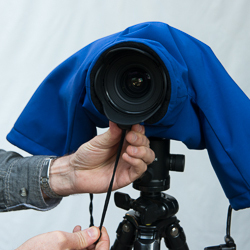 To download the PDF version, click hereSet your camera on a tripod, and leave the lens cap on.